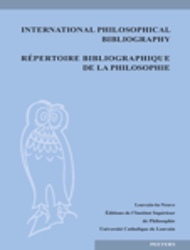 POB is accessible for all users who subscribe for the print and electronically version of the particular bibliography, respectively International Philosophical Bibliography (IPB). To qualify as an 'authorised user' of the materials, an institution must have a valid subscription in order to get online access for that journal. A subscription is valid if the institution is subscribed to the print and the electronically version of the particular bibliography. An appropriate IP-address or IP-range equivalent and an appropriate mail range (e.g. name@university.edu) to your institution must be registered to activate each electronic subscription. Note: before an IP-address or IP-range is activated, consideration should be given to the configuration of an institutional network since it is the IP-address or IP-range that is recognised by POB that will determine where the materials can be accessed throughout the institution. IP-ranges should be part of an institutional network and a campus-wide access is authorised. Private users can not be included in the institutional IP-ranges. Peeters Publishers reserves the right to withdraw the institution's access to the materials in the event of incorrectness of the information given by the institution. POB are not available for individuals. Individuals can access the bibliographies through their local institutional libraries. Peeters Publishers reserves the right to withdraw the subscriber's access to the Materials in the event of systematic breach of these conditions by any authorised user. The Materials are copyright © Peeters Publishers or published under exclusive licence from the copyright holder by Peeters Publishers.